One of America's most revered and feared critics Roger Ebert is no more. He continued to write his influential review till the very end although he had lost his voice to cancer. In a moving tribute, Ebert 'spoke' on stage about Nawazuddin's work. One of America's most revered and feared critics Roger Ebert is no more. He continued to write his influential review till the very end although he had lost his voice to cancer. 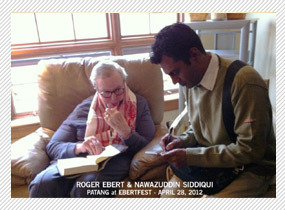 Our own Bollywood's maverick actor Nawazuddin Siddiqui discovered when he flew down to Ebert's home-town Illinois the Eberfest to screen Prashant Bhargava's ebullient Patang (a Kai Po Che without the formulistic bromance) at Roger Ebert's annual film festival in April 2012. Ebert loved Patang and specially Nawazuddin's performance. Generously, the legendary critic sought Nawaz out and invited him home for dinner. In a moving tribute, Ebert 'spoke' on stage about Nawazuddin's work. Moved beyond belief, the actor says, "He had lost his voice and in fact the bottom of his face was gone. But his passion for cinema remained the same. Mr Ebert actually gave speeches on stage. He lip-synced pre-recorded speeches on stage." To 'hear' Ebert praise Nawazuddin in such a way was the most memorable compliment of the actor's life. Recalling the memorable lunch with America's most influential critic, Nawazuddin says, "Mr Ebert and his wife played perfect hosts. Though he couldn't speak, I didn't for a minute feel any inadequacy in our communication." At the exclusive lunch with Roger Ebert, the other two guests were actor Michael Shanon (from Sam Mendes' Revolutionary Road) and the prolific Australian director Paul Cox.